A logo is the foundation of a company’s brand. Its the single most visible manifestation of the company, and for this reason, a well-designed logo is a critical part of any company’s overall marketing strategy. Logos are intended to be the “face” of a company. Through colors, fonts and images they provide essential information about a company that allows their intended target audience/potential customers to identify with them. A logo is the simplest way to represent a company’s identity in advertising and marketing materials. A strong logo is unique and fairly comprehendible to potential customers. Although there are endless choices for color, visual elements and typography, at its most simple form, a logo should convey some type of information about the company or its given industry. For example, cutting-edge tech companies tend to have angular logos to convey speed, while service-oriented companies more commonly have rounded logos to evoke a sense of service and trust. Logos are the main visual component of a company’s overall brand identity. The logo appears everywhere, on websites stationery, business cards and advertising. A well-designed logo can easily contribute to a businesses success, while a mediocre logo can shed an unsophisticated, amateur light on the company and turn away potential customers. However, consistency is key when it comes to anything logo or brand related! This is something that small business, in particular, commonly don’t do very well. The logo is the basic unit of a larger brand identity, which includes company fonts, colors and design guidelines. A logo alone, no matter how well designed, will not have a strong effect if its surrounded by contradictory graphical elements or used inconsistently. A well-designed logo implies a degree of professionalism and competence; a strong logo could be the deciding factor for a person choosing one company over a competitor. In addition, consumers are more likely to respond positively to repeated encounters with a logo as they grow to know and trust a specific brand – leading to increased sales and/or improved mind share within the brands target audience. The difference a professional looking logo can make for a company is undeniable! 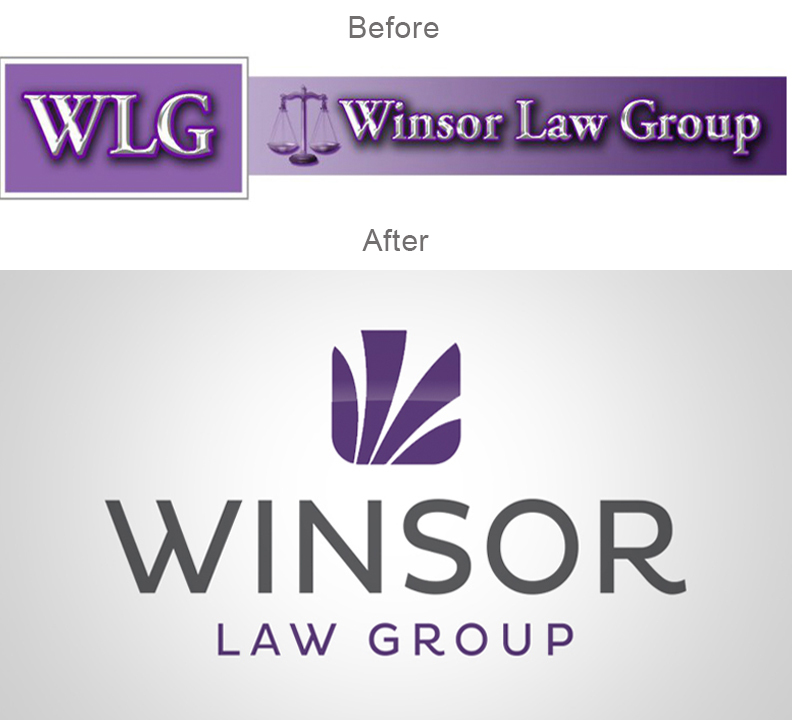 Here’s an example of a logo re-design we did for Winsor Law Group, before & after. Whether you have an existing logo that you think might need a refresh, or you want to completely start from scratch to rebrand your company; we have a talented design team to get the job done! Western Skies Restoration is a family owned and operated restoration company who came to us for a total re-design of their existing logo. Below you’ll see the ‘before’ & ‘after’ versions. Their original logo was very outdated, basic and disconnected. It really didn’t do a good job at representing the company or what they do. There are a lot of details that go into making a strong logo design. Not only does the design need to be aesthetically pleasing, but it needs to make sense! There needs to be reason behind the design that will create a connection between the logo and the company, and most importantly, the design needs to resonate and capture the attention of the company’s audience/clients! In the case of Western Skies Restoration, our design team chose to subtly represent water and fire with the colors in the logo, since the majority of the repairs that Western Skies Restoration are commissoned to do involve restoring damage caused by water and/or fire. The ‘S’ is knocked out in white to denote the sky, give balance to the overall shape of the logo and to keep the logo a 2 color logo, which will significantly reduce the cost of Western Skies Restoration’s printing projects in the future. The acronym WSR was used to help simplify and modernize the look of the logo, as well as the strong and clean typeface. 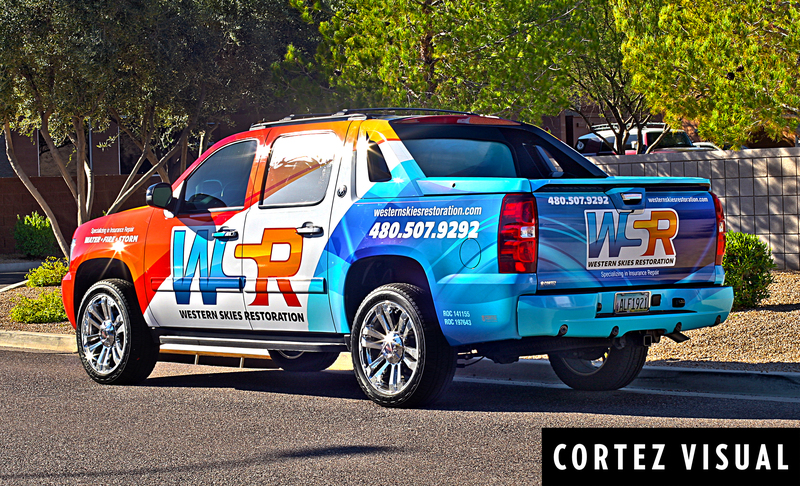 The finished WSR logo in action, incorporated onto a vehicle wrap! 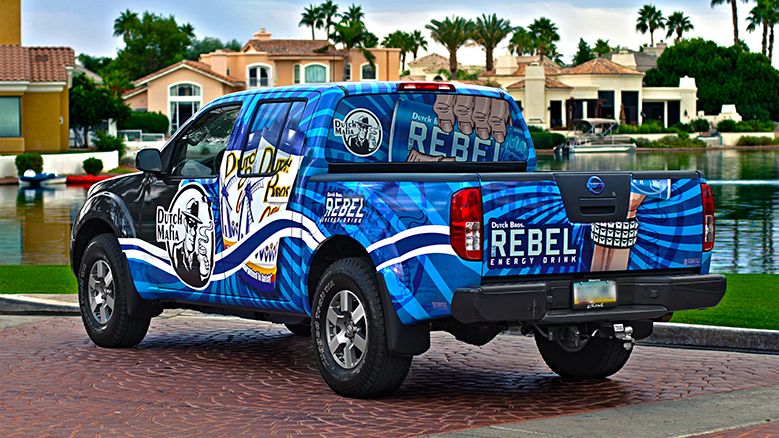 Dutch Bros – Wrap Design! It was a great opportunity to work with one of our favorite coffee joints! A couple years ago when Dutch Bros put their McQueen and Guadalupe location – it changed our office forever! How could our office get any better? We love what we do and who we do it with… Coffee. That is how! Design & Coffee? Yes please! We had a blast working with the crew at Dutch Bros. 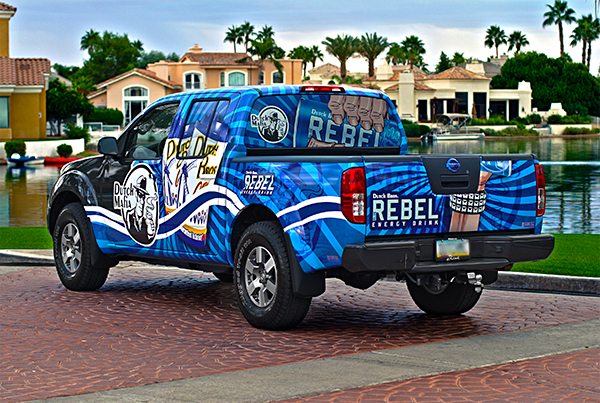 The goal was simple – create a fun and eye catching design that would cross brand their two products (Coffee and their Rebel Energy Drink). The design was to be a 3/4 wrap. We always do our very best to make sure the wrap flows into the vehicle and doesn’t stop abruptly. Color! We take pride in what we do and the equipment that does it. We were able to achieve an intense blue that really popped! This design concept can now be seen select storefronts!